Are Emily and Matt Hyland our city’s newest popular purveyors of pizza? First there was Pizza Loves Emily, the Clinton Hill wood-fired-pie joint that opened in 2014 and has been absolutely mobbed ever since. Then last year Williamsburg was blessed with Emmy Squared and the Hyland’s phenomenal Detroit-style rectangles that set a new standard for cheesy, chewy pizza goodness. 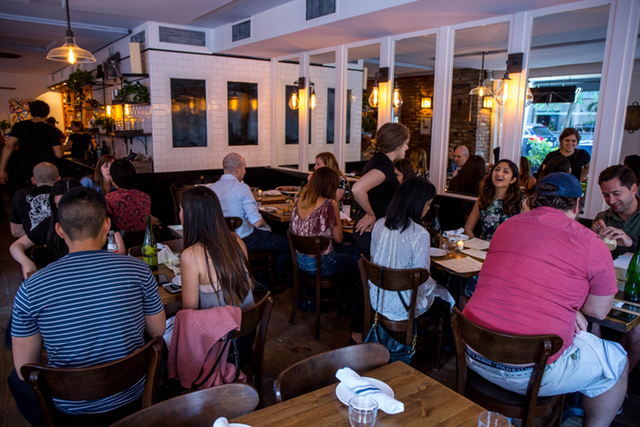 Now, finally, it’s Manhattan’s turn, with the opening last week of Emily West Village, a lovely little restaurant (it’s in the former Blue Ribbon space) on one of those impossibly charming downtown corners. The upstairs dining room, just past a small bar/waiting vestibule (and there will be waits) is where you want to sit, with its wraparound windows looking out on Downing and Bedford Streets. But there are more tables in a smaller room downstairs, which has its own cozy, brick-walled charm. And be sure to check out the ancient stone pizza oven on your way to the basement restrooms. It’s been there since at least 1906, and it’s an astonishing 18-feet deep; they left one of Blue Ribbon’s full-length paddles on the ceiling rack as a handy visualization tool of just how huge that is. The Hylands are excellent hosts, effortlessly friendly and enthusiastic about their food, and this instinctive hospitality extends through the entire staff. The West Village Emily serves two distinct pizza types, and all four pies I tried last week (two of each) were delicious. There are multiple options within Emily’s “Detroit-Grandma” category, too many to get into here, but just know that these six-slice rectangular pies are slightly less thick than the Emmy Squared ones, and are every bit as good. The Madre features a dense, baked-in-cheesy crust laden with mozzarella, crumbled chorizo, and a spreadable mound of tomatillo sauce. This was amazing, as was the Pig Freaker, a sauce-free pie with queso miso, thick chunks of chewy bacon, a bit of lively kimchi scattered about and a sprinkling of sesame seeds. There are far fewer choices in the thin-crusted, 12-inch “Round Pies” section, but they’re all fired in that massive oven downstairs. The Margot is cheese-less pie with a cracker-esque crisp, with all of the heavy lifting, flavor-wise, carried out by a coating of tangy tomato sauce, a bit of garlic, and seven tiny piles of spicy anchovies. It’s nearly not-pizza, but it’s remarkably good. The Classic, on the other hand, brilliantly captures the essence of the NYC slice, the crust kept just soft enough to comfortably fold (but holding firm all the way to the center… this pie is not “wet”), the two wonderfully salty cheeses—mozzarella and farm cheese—melted on thick, the tomato sauce providing a bit of sweet, acidic relief to all the dairy. There are other things to eat at Emily besides pizza, and at least two of them are terrific. The Smokey Carrots are roasted to caramelized perfection, a scoop of spicy tahini elevating the interest level considerably, and the layer of black lentils lurking below really giving the dish heft. And the also-roasted Oki Veggies, which turned out to be broccoli and cauliflower, had both surprising intensity and depth, thanks to a quartet of toppings not generally found in a pizza place: kewpie, okonomi sauce, aonori, and bonito flakes. The dry Lammy Burger was the only disappointment, desperately in need of something to glop it up, but since Hyland is a messy-burger master, I imagine things will change on this one. The chef’s new Curly Fries that come with the burger (and which can be ordered as a snack), however, were superb examples of that most excellent fry genre. The pizza at Emily West Village is great, which is all you really need to know, and it comes in enough intriguing, genuinely different varieties that I’m already strategizing a trip back there as soon as possible and make my way through more of the menu. That it’s also a fun, comfortable, welcoming restaurant is a nice bonus. Note, though, that I’m far from the only one excited about this place: there was a line outside for the 5 p.m. opening both times I went last week, and I can’t imagine things got less crowded as the night went on.